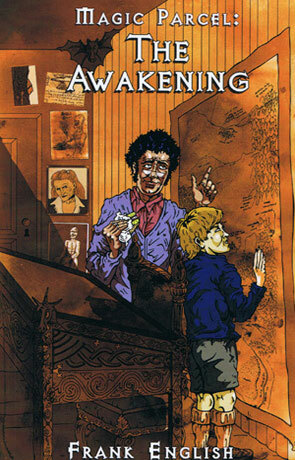 Magic Parcel: The Awakening is a young adult fantasy novel by Frank English. Jimmy Scroggins is a lively nine year old, full off the inquisitiveness of youth, living with his mother since his father passed away he spends much of his spare time with his Uncle Ruben, to the relief of his occasionally exasperated mum. His Uncle has always been a very enigmatic figure and it soon becomes clear that there is more to him than meets the eye. After volunteering to deliver a parcel to the local post office, Jimmy finds himself thrown into the middle of an incredible adventure in a completely different world (known as Omnia). Tommy, Jimmy's older brother has been through all this before and dashes to join Jimmy, offering his help and experience. Things have changed much since Tommy was last in Omnia though, the evil lord Seth has grown powerful and now threatens the peace and safety of the realm. It isn't long before Tommy and Jimmy become embroiled in the battle of power and they will need the help from all their new and powerful allies if they are to survive. Magic Parcel: The Awakening is a fast paced easy reading book full of vivid, memorable larger than life characters and rich descriptive language. The book has a friendly, comfortable feel but with the occasional very detailed scene and flowery prose. These lines really make the book stand out and is a great tool to encourage the younger reader to subtly expand their literary knowledge. The world building is both descriptive and insightful without disrupting the pace of the plot, which keeps you on your toes with many twists and turns. The ending is quite unusual in a young adult novel with a bit of a cliff hanger, used in many adult novels but rarely in children's books and a positive reinforcement to really stand out from the crowd. Magic Parcel: The Awakening is a great novel for the younger reader, full of excitement, danger suspense and magic. Written on 21st July 2010 by Ant.